HOW WOULD LIFE LOOK IF YOU WERE READY TO RELEASE: Fear, Jealousy, Power, and Control? 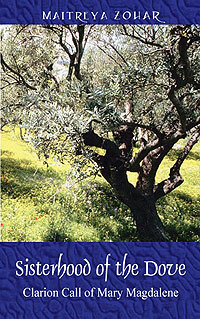 Sisterhood of the Dove explores the life of Mary Magdalene, or Miriyam as she called in this book. While seated in a temple dedicated to the Goddess Isis in Ephesus, Turkey; Miriyam's youngest daughter Rachel tells the 400+ initiates who have come to enter the Sisterhood and accept the Dove into their hearts, of her mother's life. Rachel shares of Miriyam's childhood; her joys of her sacred union and travels with Jesus, or Yeshua as he is called in this book; her love of her mother-in-law Mary and the Goddess teachings; her deep grief at the loss of her beloved; and her commitment to honor the Goddess, build a temple, create various secret societies, up to her choice of death in her late 60s. Miriyam's life is intricately connected with a soul group of 22 who incarnated to raise the consciousness of humankind by offering the opportunity to live in the absence of fear, jealousy, power, and control; by offering humanity the key to freedom and liberation. THOSE TEACHINGS ARE AVAILABLE TODAY! "One of the greatest teachings Miriyam received from Yeshua was taught through Sarah's behavior. When Sarah was about a festival old, she crawled away and out of Miriyam's sight. Miriyam became frantic over her disappearance and went for Yeshua. "At that point, Miriyam retorted, 'Why do I have all these people following me around when I want my privacy?' He laughed and walked away. "After Yeshua had walked away, Miriyam knew, 'There is nothing I can control. There is nothing I should want to control. I need only fall into the arms of the Goddess and trust.' As she surrendered to this knowing, a dark cloud came up and out from the base of her spine through her heart. Miriyam physically saw gray smoke emerge from her body and leave her being. She felt different after that. She looked into one of her shiny, metal plates and saw that she had changed. "It was during the next sun that Yeshua looked at Miriyam with his beautiful smile and gave her the most tender hug. Miriyam wept in his arms while he caressed her head. He never told her he was proud of her, in words, but he radiated it and she felt it to the depths of her being. Rachel stood beside the sacred ceremonial pool located in the center of the temple; her eyes followed the pillar in its center up to the large, flawlessly polished, black stone, which lay upon an altar atop the pillar. One of the purposes of the stone was to capture the light from Sirius as it shone. The water in the pool absorbed the newly stored energy in the stone. Each would drink of the Goddess and her unconditional love during the initiation. The entire pool and the altar area had seven thin, tightly woven fabrics in the colors of the rainbow, brought from the Far East, and placed over it to maintain the cleanliness of the liquid. The sacred liquid had several uses of which two were: ceremonial purification and water for drinking. The water in the pool, refreshed by the sisters each new and full moon, was fed into the temple from the river, which lay a short distance outside the Gateway of the West. As Rachel drank, she looked at each of the eight enormous arches, four of which were called gateways. Each arch had a unique symbol carved into its center, which reflected the qualities taught within the Sisterhood. Starting with the Eastern Gateway and moving clockwise around the temple, the first arch held the symbols of the dove and the rose. The dove was for the Holy Spirit, which represented absolute healing of the physical, emotional, and mental natures of human beings. The rose was a symbol of openness and surrender. Sisters were asked to model their behavior after the rose, opening themselves to the Holy Spirit as the rose opened itself to the sun. The second arch held the sun, the moon, and the stars. The sun symbolized the active, masculine principle within the universe, the moon symbolized the receptive, feminine principle within the universe, and the stars were present to remind the sisters that they were each an integral part of the grand tapestry of the Goddess. The third arch, the Gateway of the South, held the symbols of wheat and fruit. These were for prosperity, bounty, and nourishment, and were reminders to all that the Garden was their true provider. The fourth arch held the symbol of the olive branch, which stood for everlasting peace. The fifth arch, the Gateway of the West, held the sign of the six-pointed star. This symbol was formed by two interlocking, equilateral triangles facing in opposite directions. The triangle with its point facing downward symbolized the higher self entering human form. The triangle with its point facing upward symbolized the lower self ascending. As the lower rises and the upper descends, they form what is called a six-pointed star with the true heart of a human being at the center of the star. The sixth arch held the symbol of the chalice, the vessel that receives the spirit. When the human being, man or woman, embraces his or her inner Goddess he or she, in essence, becomes a chalice full of the eternal spirit. The seventh arch, the Gateway of the North, held the symbol of the ankh. The ankh is the symbol of the Goddess Isis and the key to eternal life. Lastly, the eighth arch held the sign of the Vesica Pisces. The Vesica Pisces, with its two perfectly interlocking rings, stood for perfect love and sacred union within the human form. A dove landed upon Rachel's shoulder, interrupting her thoughts of appreciation for the labor of love her mother, grandmother, and countless others had put into the creation of the temple. Soon the now silent temple would yield to the sounds of joy, laughter, storytelling, and celebration. Rachel walked to her seat and awaited her sisters. She sat bundled up, as it was a chilly evening. Early in March 1987, Maitreya met world-renown psychic and spiritual teacher Shoshana/Ortalia Rogers, an encounter that sent him on a new spiritual path, one that would take him from Toronto, Ontario, CAN to Brooklyn, New York, USA, then on to Los Angeles, California, USA and finally on to Kansas City, Kansas, USA to pursue his metaphysical career and assist in the building of a spiritual community. Along the way he was ordained as a minister with the Universal Brotherhood Movement, Inc.
Maitreya currently serves as a channel, psychic, healer, metaphysical teacher, ionCleanse practitioner, and leader of sacred global healing journeys throughout the world.